Prancing what? That is not a misspelled Spanish word, I did not intend for this blog to be named Prancing Papi. So, what really is a Papio? Papio is a genus; all baboons belong to the genus Papio. Previously, Gelada, Mandrill and Drill were also grouped into the same genus but they now have their own separate genera. Gelada belongs to the genus Theropithecus while Mandrill and Drill belong to the genus Mandrillus. Gelada, Mandrill, and Drill are still colloquially referred to as baboons. Currently the genus Papio has 5 recognized members. 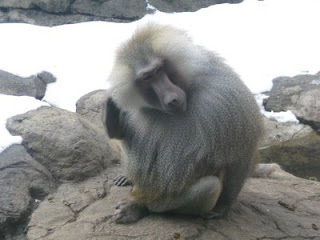 There are disagreements among scientists whether Hamadryas baboons are a separate species while the other four are subspecies or they all represent 5 different species of the same genus. 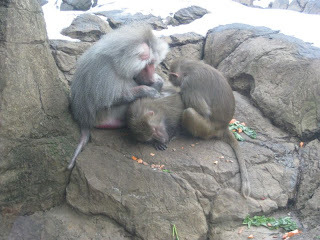 You will see that Hamadryas baboons are listed as either Papio hamadryas or Papio hamadryas hamadryas. Based on the biological species concept, I consider all 5 members of the genus Papio to be a subspecies of Papio hamadryas because they can reproduce and produce virile offspring hybrids. 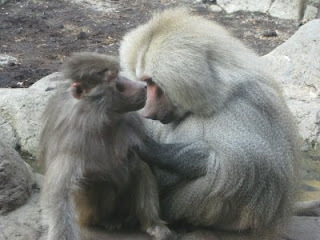 The closer the range of two baboon species, the higher the frequency of interbreeding is. This zone is sometimes call the hybrid zone. According to the ecological species concept, however, I consider all 5 members of the genus Papio to be 5 different species. So, depending on what your species concept is, there are different ways to classify them. How would you classify them and why? Chacma Baboon, Papio ursinus (found in southern Africa). Guinea Baboon, Papio papio (found in the far western Africa). Hamadryas Baboon, Papio hamadryas (found in the Horn of Africa and south-western Arabia). Olive Baboon, Papio anubis (found in the north-central African savanna). Yellow Baboon, Papio cynocephalus (found in south-central and eastern Africa). Male Hamadryas baboon (Papio hamadryas), The Prospect Park Zoo. Hamadryas (Papio hamadryas) females. The Prospect Park Zoo. Female Hamadryas and Olive baboon hybrid (Papio hamadryas x Papio anubis) The Prospect Park Zoo. Fossilized footprints were found between two sedimentary layers in Ileret (Rutgers' Koobi Fora Field School), Kenya that dates back about 1.5 million-years-ago. These footprints show that its owner was walking upright, bipedally and the foot already had the anatomy like those of modern humans: relatively adducted hallux (big toe), medial longitudinal arch and medial weight transfer before push-off. 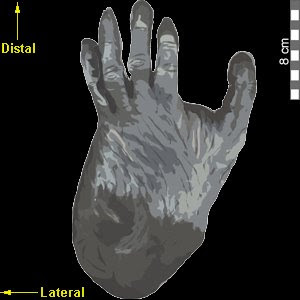 The size of the footprints corresponds to the stature and body mass of Homo ergaster, an earlier version of Homo erectus (Bennett et al., 2009). Cover of Science, 27 February 2009. Optical laser scan of early hominin footprints at Ileret, Kenya, color-rendered to illustrate depth; reds indicate areas of high elevation, blues lower elevation. 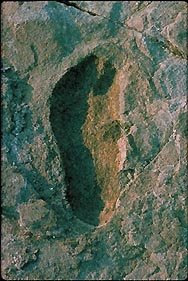 The footprints are 1.5 million years old and were probably made by Homo ergaster/erectus. 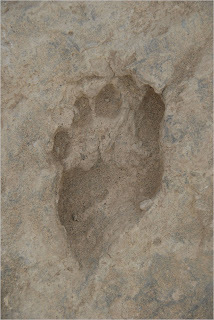 Two right footprints and a partial left are visible along with a range of animal prints. Image processing in RapidformTM: Matthew Bennett/ Bournemouth University. These footprints are distinct from the "famous" Laetoli footprints, discovered by Mary Leakey in 1976 at Laetoli, Tanzania which dates to about 3.5 million-years-ago. The Laetoli footprints belong to Australopithecus afarensis and at least two individuals were present, walking side by side. The Ileret footprints are different and similar to the Laetoli footprints in many ways. 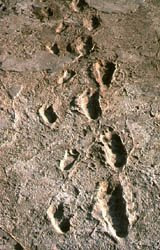 Laetoli footprints are more ape-like, Ileret footprints are more human-like. Both, however, do not have an opposable toe like those of chimpanzees. Both footprints indicate that its owner was walking bipedally or has a bipedal gait. Read more on "Prints Are Evidence of Modern Foot in Prehumans" by John Noble Wilford. 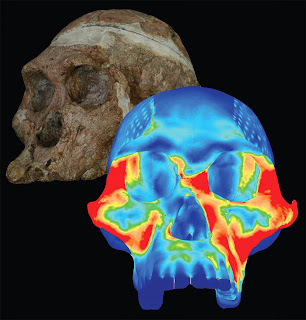 Rutgers' Press Release: 1.5 Million-Year-Old Fossil Humans Walked on Modern Feet. 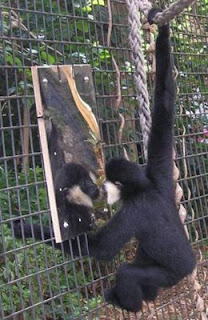 Mirror Mirror On The Wall, Who Is That Other Gibbon? 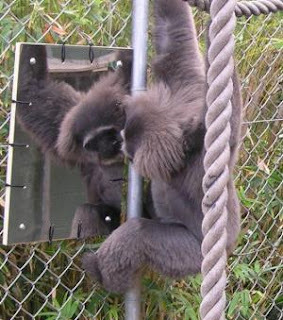 Gibbons (lesser apes) have no use for mirrors, studies had shown (Suddendorf and Collier-Baker, 2008). They are not able to recognize themselves in front of a mirror. Typical human children starts to recognize themselves in front of the mirror around two-years-old. Mirror self recognition or visual self recognition is not unique to humans, it was only documented in great apes (chimpanzees, bonobos, orangutans and gorillas). Humans and great apes are different than other primates because they can recognize themselves in front of a mirror. Self recognition in front of a mirror enable them to see areas of the body where they cannot see directly. Self recognition probably evolved in the common ancestors of great apes around 18 million years ago. Read more about "The evolution of primate visual self-recognition: evidence of absence in lesser apes" by Suddendorf and Collier-Baker, 2008 (full article) (abstract). Large and heavy premolars from fossil hominins are traditionally viewed as indications of a diet consisting of small, hard objects or massive amount of food. Using finite element analysis in conjunction with comparative, imaging, and experimental methods, Strait et al. (2008) came up with a modified conclusion: these large and heavy premolars served as nutcrackers to break open hard nuts and seeds. A shift to nuts and seeds diet may explain that A. africanus were exploring new food resources, possibly due to a scarcity of preferred food source. Early Humans Had Nutcracker Jaws. What are the implications of this research? Does it mean that our hominin ancestors (A. africanus) were forced to exploit new food resources earlier than we had thought? Were there environmental changes that lead to lower production of preferred food sources (possibly fruits)? Exponential increase of Australopithecine population in a shrinking forested habitat forced some individuals with larger and heavy premolars to exploit new food resources (nuts and seeds)? Strait DS. Weber GW. Neubauer S. Chalk J. Richmond BG. Lucas PW. Spencer MA. Schrein C. Dechow PC. Ross CF. Grosse IR. Wright BW. Constantino P. Wood BA. Lawn B. Hylander WL. Wang Q. Byron C. Slice DE. Smith ML. 2008. 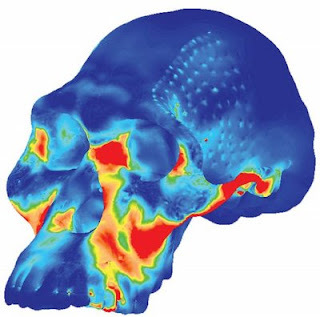 The Feeding Biomechanics and Dietary Ecology of Australopithecus africanus. Proceedings of the National Academy of Sciences of the United States of America 106 (8) 2124-2129. Do you know that the difference between human and chimpanzee genome is only 2% ? That genetic difference involves mostly genes that are related to the immune system, infectious disease and also vulnerability to parasites (Sapolsky, 2006). Chimpanzees are resistant to malaria while we humans are scrambling to find a cure for this epidemic. Researchers are now trying to understand how chimpanzees are resistant to malaria and use that knowledge to find a cure. Erica Tassone, a biology graduate student, is currently working on malaria research with Stone and Vellerri for her dissertation project, which she started in fall 2007. 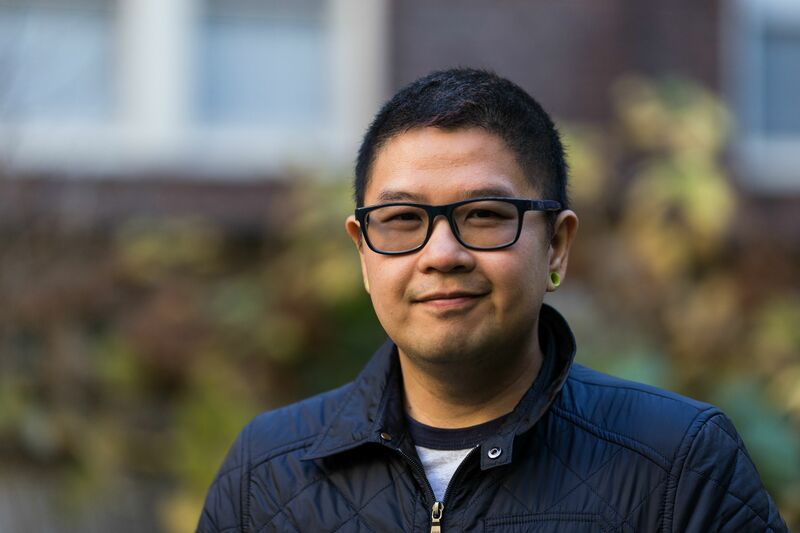 “I look at genes associated with malaria resistance in chimpanzees and see how they’re the same or different from those genes in humans,” Tassone said. Although Tassone said she is also interested in doing research on how genes act in a cell, her main concentration now is the disease research. “[I hope] to get a better understanding of how humans and chimpanzees have evolved and developed resistance to diseases,” Tassone said. Click here to read the full news article. Ever wonder why our toes are stubby instead of long and slender like our fingers? Long toes require more energy and generate more shock as compared to short toes, according to biomechanical analysis. Shorter toes are an adaptation favored by natural selection. 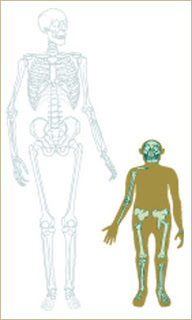 Australopithecines, our first bipedal ancestor, had longer toes than our genus Homo but smaller than those of great apes. Rolian C. Lieberman DE. Hamill J. Scott JW. Werbel W. 2009. Walking, Running And The Evolution of Short Toes in Humans. Journal of Experimental Biology 212 (5): 713-721. What is Homo floresiensis? This question has plagued scientists since the 2003 discovery of these hominids in the remote island of Flores, Indonesia. A few specimens, found only inside the cave of Liang Bua in Flores, were given the names LB1, LB2 and so on. Their small stature, thought to be no taller than a three-year-old human child, led to them being nicknamed “Hobbits” by scientists after J.R.R. Tolkien's tiny “Lord of The Rings” characters. Homo floresiensis is thought to have co-existed with modern humans starting from about 18,000 years ago to about 13,000 years ago -- pretty recent in geological time. What Is The Hobbit? A recent article suggests that Homo floresiensis existed alongside modern humans (Homo sapiens sapiens). 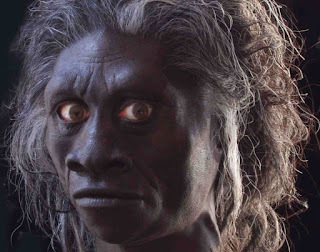 If Homo floresiensis were indeed contemporaneous to modern humans, then they could have been the sourceof local myths such as the “Ebu Gogo” and “Orang Pendek”. 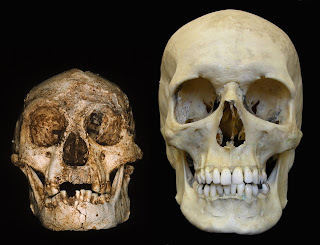 Cryptozoology and mythology aside, scientists are still debating whether Homo floresiensis is a species of its own or just a small population of Homo sapiens sapiens that suffered from cretinism. So who really were Homo floresiensis? A species of their own or just individuals that suffered from cretinism? We still do not know. If Homo floresiensis were indeed a species of their own, did they evolve out of Austrolopithecine, Homo erectus or even archaic Homo sapiens? If Homo floresiensis were actually archaic Homo sapiens suffering from cretinism, how did they survive well pass adulthood and use stone tools to hunt? Currently there is no consensus whether Homo floresiensis were a separate species or just individuals who suffered from cretinism. What do you think? I'm currently working on a Senior Honors Thesis before I graduate this Spring. 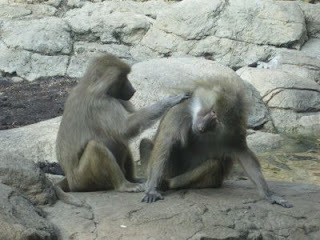 It's a comparative study of grooming between gelada baboons (Theropithecus gelada) and hamadryas baboons (Papio hamadryas hamadryas). This study is being done in The Prospect Park Zoo and The Bronx Zoo (Both are Wildlife Conservation Society Parks). Prospect Park Zoo houses a troop of hamadryas baboons indoors while gelada baboons can be found in an outdoor exhibit at The Bronx Zoo. 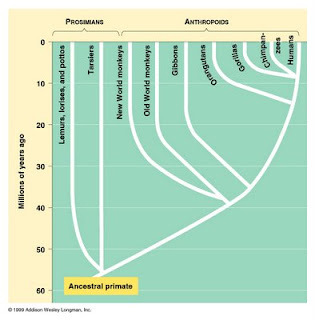 I will write about how my research is progressing on this blog, along with news and articles related to primates and hominins. Below are some pictures of my focal animals.